Met Éireann has issued four weather warnings that take effect from Sunday evening. 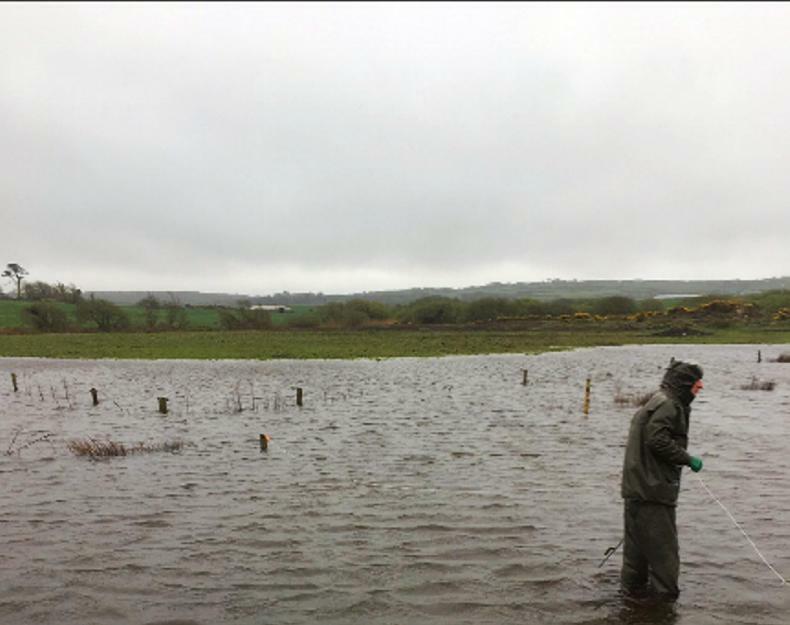 Flooding on Cathal O'Sullivan's farm in Cork. Farmers in west Cork have reported flooding on some ground, but more rain is expected to hit again on Sunday night. An orange rainfall warning is in place for Cork and Waterford, valid from 6pm Sunday evening to 6pm Monday evening. Hazardous driving conditions are expected, with flooding possible. Rainfall amounts will be highest along the south coast and about higher ground. A status yellow rainfall warning is in place for Kilkenny, Wexford, Kerry, Limerick and Tipperary during the same time frame. Heavy rain Sunday night and Monday will bring a risk of spot flooding, especially in southern parts of these counties. Meanwhile a yellow wind warning is in place for Donegal, Mayo, Cork and Kerry from 2am on Monday to 7pm. Strong and gusty southeasterly winds are expected during the period. Mean speeds of 50-65km/h with gusts of 90-110km/h, strongest in coastal areas and about high ground. A yellow wind warning is also in place for Dublin, Carlow, Kildare, Kilkenny, Laois, Wexford, Wicklow, Offaly, Leitrim, Roscommon, Sligo, Clare, Limerick, Tipperary and Waterford for 12 hours from 5am Monday morning. Strong and gusty southeasterly winds will reach mean speeds of 50-60km/h with gusts of up to 100km/h possible, strongest about high ground. Fire brigades from Carrickmacross and Castleblayney attended a hay barn fire on Saturday night in Co Monaghan. Meanwhile, crews in counties Dublin and Wicklow battled several gorse fires in the hills along the border between the two counties in the past two days. Wicklow Fire Service reported gorse fires at Clogga, near Roundstone on Friday, and at Ballyfolan in the Kippure valley on Saturday. Dublin Fire Brigade tackled a number of brush fires along the southern edge of the city, including a gorse wildfire near the Hellfire club on Saturday. These incidents follow a large gorse fire in Annagry, Co Donegal on Friday, which destroyed two houses in the area. Firefighters have urged members of the public to be vigilant when out in the countryside this Easter weekend as dry, warm weather conditions continue to pose a fire risk. The Department of Agriculture has issued a status orange forest fire warning valid until Tuesday. "Most recent fire incidents appear to have taken place on lands associated with turf cutting, but additional risks may also exist on areas commonly used for public recreation," the Department warned. Controlled burning of vegetation on agricultural land is not permitted until 31 August. Independent European election candidate Peter Casey has said he would fight for a larger budget for the next CAP if he is elected MEP next month. “The CAP budget must be increased to account for inflation and to compensate our farmers for any additional requirements imposed on them by the newly reformed policy,” Casey said in a statement this Sunday. Outgoing MEPs on both the agriculture and budget committees have already passed motions in favour of an increased CAP budget after 2020. The level of funding now depends on contributions agreed by national governments in all EU member states. The Midlands North-West candidate has also called for direct aid in case of a hard Brexit including emergency EU market disturbance supports, targeted direct producer payments, long-term structural adjustment support and the setting-aside of State aid limits. “Should we find ourselves in a no-deal Brexit situation, there must be provision for an immediate EU aid package to support our farmers and safeguard the presence of their produce on UK shelves. It is also important that any EU aid takes account for currency devaluations arising from a weakened pound,” Casey said. He will be among candidates taking part in the first of a series of husting organised by the IFA on Wednesday in Claremorris, Co Mayo. Click here for a list of all other candidates in the European election. There has been a steady rise in the number of non-fatal accidents involving livestock over the last 20 years, according to figures from the annual Teagasc National Farm Survey. In 1996, livestock were involved in 23% of all non-fatal accidents. The latest figures show livestock now accounts for 43% of all such accidents. Minister of State for Trade, Business and Employment Pat Breen said the rise in accidents relating to livestock was largely in line with expansion in the agriculture sector and the significant increases in dairy and beef numbers. Responding to a parliamentary question from Fianna Fáil’s Robert Troy, the minister said work was continuing with the Health and Safety Authority (HSA) to encourage safe livestock management. Figures would indicate there is widespread under-reporting of non-fatal accidents involving livestock. On average, 100 non-fatal accidents in the agriculture sector are reported to the HSA annually. In comparison, figures from the annual farm survey indicate there are between 2,500 and 3,000 serious non-fatal accidents on farms each year. Minister Breen said the sector was predominantly made up of self-employed and sole traders, who “unfortunately do not always report their accidents or injuries to the HSA”. It is a requirement for all workplaces, regardless of size, enterprise or sector, to report accidents which result in an absence and the prevention of an employee from performing their normal work for more than three consecutive days. When it comes to fatal accidents, livestock account for 16% of all deaths in the agriculture sector. In 2018, five people were killed following incidents with livestock. Cows and heifers are by far the most dangerous category of livestock. They were involved in over half of fatal accidents, which mainly occurred during the calving period. Bulls represent 15% of livestock deaths, while horses account for a further 10%. Previous HSA inspection campaigns indicate that livestock handling facilities are generally good, with the risks of injury arising when handling facilities are either not used or not used properly.